Glasgow psych rockers The Cosmic Dead have certainly pushed the boat out with this collection of songs. Following the release of their acclaimed self-titled debut earlier on this year there has been a great deal of anticipation for Psychonaut and it certainly does not disappoint. 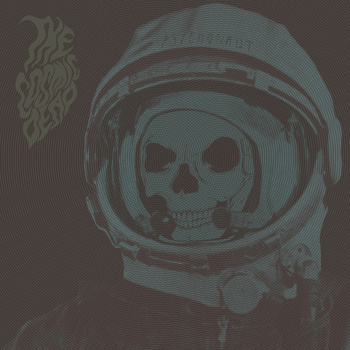 Psychonaut is less of an album and more of a journey through astral plains and the cosmic fields. Opening track ‘Lavinia’ is a slow burning wave of instrumental sound that completely envelops the listener and is probably better described as a jam than a track. The pace of the album changes with following track ‘The Spaceman’ which enlists an additional band member to add ethereal background vocals to the phaser-driven number. This riff-heavy, percussion driven pace makes up the core of the album with tracks such as ‘Psych Ashtray Aktion Mother’ and ‘Serpent Coils The Earth’ which is a thrashy, edgy tune full of heavy distortion and squealing feedback. Interspersed between these tracks are slow floating numbers such as the shortest track on the album, ‘Adimite Obscuritatem’ which sounds distinctly spiritual with tribal style drumming and harmonic droning vocals complimented by a subtle didgeridoo effect. Another slow number is ‘Austral Curvature’ with bassy grooves overlaid with screeching, trippy guitar and slicing percussion. After listening to Psychonaut you should certainly feel just a little bit spaced out and with many of the tracks being over seven minutes long it’s not for the casual listener. But, with a little patience, Psychonaut is a brilliant album with a hell of a lot to give.